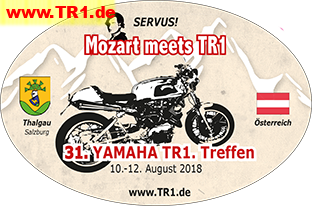 Many thanks to Wolfgang Rau who designed and sponsored again the 2018 sticker. Robert "Grieche" Mayer sent me a nice and long story about the weekend in Thalgau/Austria. Here you find his original writing in German. For an automatic translation to English (and other languages) use this link. And, many visitors asked him why he is called "Der Grieche" ("The Greek"). Therefore he shares the story of his name with us. Click here. And here for a translation of the text. All videos are compressed. In fullscreen mode, they might not have sufficient quality!